Quality pet food is seemingly hard to come by. If you recall, a couple years ago our family discovered By Nature - and was given the chance to try out their All Natural Dog Biscuits. Since that time, we've been feeding By Nature Grain Free Chicken & Potato Formula with fantastic results. 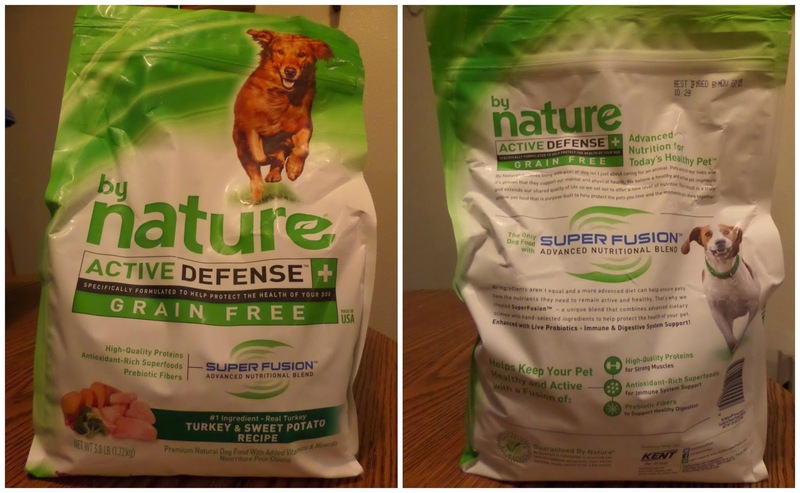 Recently, By Nature launched a new line of pet food called their Active Defense Plus line. 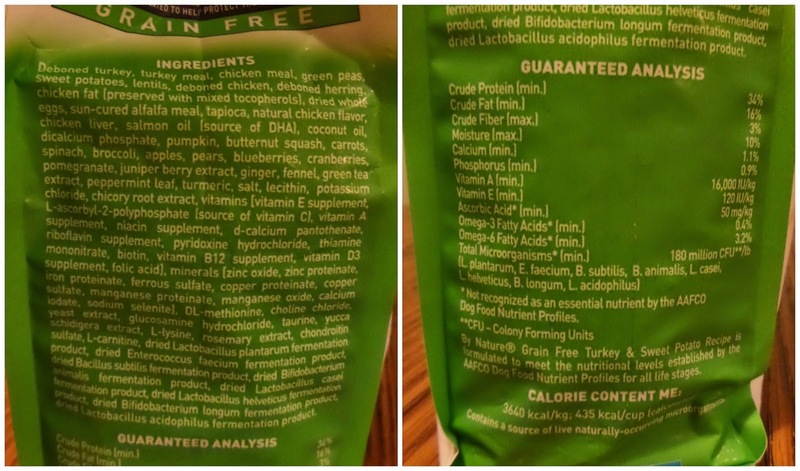 This line has reformulated their existing pet foods into a formula designed to protect the health of your pet and help keep your pet both healthy and active. By Nature produces their products in the USA, and the first ingredient of their foods is meat, fish, or poultry. By Nature currently has available their dry balanced diet foods, dry grain free foods, and balanced treats - and soon will have active defense wet foods to add to the line as well! By Nature sent Venus their Grain Free Turkey & Sweet Potato Recipe to try out. I really like that the first three ingredients are a meat. I already had high hopes for this food before I even opened the bag! Speaking of opening bags... I love that this bag has it's own seal that can be zipped back closed to keep it fresh. I hate having to transfer food to another container to keep it sealed up, as the pouring exposes all the food to any contaminants that may be in the air. I became slightly concerned by the size of her new kibble (on the right) compared to her old kibble (on the left). Luckily, the size of the new Active Defense+ kibble isn't too terribly large, but if she were even smaller I do think that this new kibble would prove difficult for her to chew. 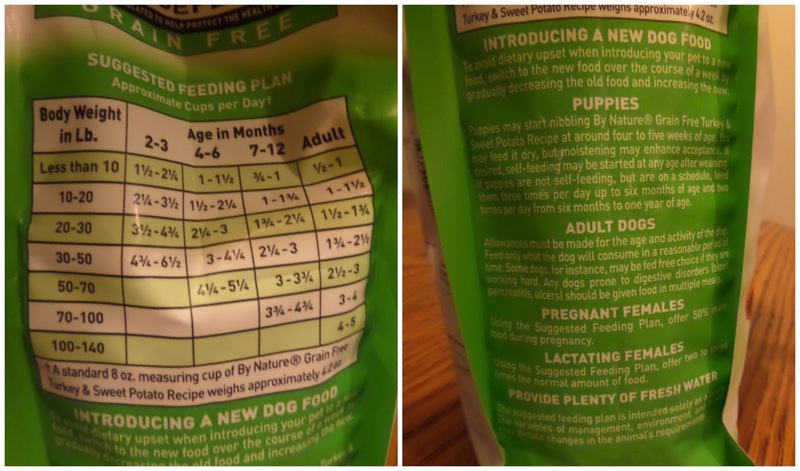 After going through a short transition period since this was a new food - but still a grain free food, and from the same company - we started off feeding Venus 3/4 of a cup per day. This is a tiny bit more than what we were feeding with her old food, and while this is what she should be fed based on her ideal weight and the kcal per cup in this food - we noticed she started putting on weight. So we cut her back to 1/2 cup per day with added veggies for snacks. She stopped gaining weight, but she hasn't started loosing any weight yet either. Aside from the weight gain, Venus' coat has become even more healthy looking, shiny, and soft. She's had less hip and knee problems since starting this food too! I'm a very happy chihuahua-mama right now. By Nature has not let us down, and will continue to be our pet food manufacturer of choice when it comes to providing healthy and trustworthy food for Venus. If you would like to find more information about, or purchase, By Nature's new Active Defense+ pet food - you can find it in store by using the handy tool on site, or at my favorite pet food retailer, Chewy!